When Aboriginal people use fire to manage country they consider a plethora of parameters. Read why cool fires are key and why the canopy is sacred. Tonnes of greenhouse gas emissions avoided in 12 months by letting Aboriginal people manage burns . Factor by which introduced weeds can increase fuel loads . Percentage of Australia's total greenhouse gas emissions caused by methane and nitrous oxide emissions from savannah burning ("hot fires"). Savannah covers about one quarter of Australia . Fire is an important symbol in Aboriginal culture. Traditionally it was used as a practical tool in hunting, cooking, warmth and managing the landscape. It also holds great spiritual meaning, with many stories, memories and dance being passed down around the fire. Fire management is part of how Aboriginal people look after country. After World War II, missions towns and cattle stations lured Aboriginal people away from their homelands with promises of work and education . Fire management stopped with severe consequences for the land. Lightning strikes ignited large, hot fires late in the dry season, between August and December, when there was plenty of fuel. The devastating 2015 Christmas bush fire at the Great Ocean Road in Victoria, triggered also by lightning, was only able to destroy a third of homes in Wye River and "entire streets" because "this country has not burnt, had a fire in it, in decades," as Craig Lapsley, Victoria's Emergency Management Commissioner admitted . This trend has not been reversed yet. "Since European settlement, fires in the north have increased in size and severity. This has threatened biodiversity as well as increased greenhouse gas emissions," says Dr Garry Cook from the Commonwealth Scientific and Industrial Research Organisation (CSIRO) . When Aboriginal people returned to country and properly managed it, the area that burned was cut in half . Fire is an inevitable force in the dry season and needs to be managed. Fire burning has created a variety of habitats including places that are very sensitive to fire like rainforest. Managing fire requires knowledge about when to burn, where to burn and how to execute a burn . Fire-managed country. Notice the lack of tall grass or thick bushes. This would have been an ideal hunting ground a few weeks after a fire. Ideal is the early dry season, between May and July, when fuel loads are low. You don't want to burn when certain seeds or fruits are ripe for harvest. If burning too early, big thick shrub develops after the fire which can become a big fuel load and is hard to manage. If burning occurs too late, trees 'explode' during the fire and not much will be left after the fire goes through. The right time depends on the ecosystem of the burn area because each system has its own identity and needs. An ecosystem is for example a forest of boxwood or tea trees, rainforest, or heath areas along rivers and springs. A central idea in fire management is to have a cool fire. Night time or early mornings are ideal for cool fires as during the day plants sweat out flammable oils, and a nightly dew helps cool down the fire. During a morning burn the wind is often gentle and supports Aboriginal people direct the burn. Without the help of the wind burning cannot happen at the right time. The sun, in contrast, encourages the fire to burn. Like a non-Aboriginal person reads a book, Aboriginal people can read the land to determine which areas need fire management. They prepare a burn by looking at the different ecosystems, patches, fuel loads, grasses, soil type, and the kinds of ashes a fire will leave behind. It is not “one big grass area to be burnt”. Trees tell Aboriginal people about the soil type and this tells them what type of fire is needed. Aboriginal people know which areas will burn and where the fire is going to stop. Some areas "want to be burnt" while others need to rest and regrow. Burning usually occurs at the edge to the next ecosystem to not affect it as it might require a different approach of fire management at a different time. Saves flora and fauna. Animals, including beetles and ant colonies, have enough time to escape. Young trees can survive and the fire keeps grass seeds intact for regrowth. The heat doesn't ignite the oil in a tree’s bark. Self-extinguishing. The fire extinguishes straight after it burns the grass (“self-extinguishing fire”). You can tell if a fire was a cool burn when the burnt grass still has its previous shape. Aboriginal people read the systems of fire--the grass, soil type, what animals live there and how they benefit from it. Burning styles differ depending on how "sick" the land is. To start a fire, Aboriginal people traditionally used a tea tree bark torch. Contemporary fire management uses either a kerosene bark torch (the oil in the bark keeps torch alive) or a drip torch (hot fires). The first fire burns a circle around Aboriginal people’s living area so they are safe. Early dry-season, cool fires trickle through the landscape and burn only some of the fuel, creating a network, or mosaic, of burnt firebreaks. These stop the late dry-season, hot fires. Protection and provision. The canopy provides shade, fruit flowers and seeds. It allows animals to come back quickly. Carbon reduction. Unlike a cool burn, a canopy fire releases too much carbon. Local land managers can then sell carbon credits for the emissions avoided . Fire refugee. When there’s a fire insects and other small animals crawl up the tree to safety. Preserve tree cycle. With its canopy intact the tree does not miss its cyclic renewal. Trigger for germination. The smoke from a cool burn goes through the canopy and triggers off a reaction for seeds up there to germinate. No wonder that Aboriginal people consider the trees' canopy "sacred". This is in stark contrast to how non-Aboriginal people understand fire. “Non-Indigenous mob, their fires are based on their money,” complains David Claudie . Non-Aboriginal people, like pastoralists or officers in land management departments and other government bodies, are trying to learn how to manage fire correctly on their own, but the knowledge is right there under their nose, with Aboriginal people. All they need to do is ask for help. Some do. Fire cannot be managed from the air alone, you need to have people on the ground. Aboriginal Elder Terrah Guymala is a senior member of the Bordoh clan of the Warddeken people in remote west Arnhem Land and director of Warddeken Land Management. He uses a "two toolbox" approach to manage fire: One virtual toolbox contains traditional knowledge and land management skills, the other Western knowledge like using helicopters and satellite imaging . This combined knowledge lets the Warddecken people manage their country successfully. 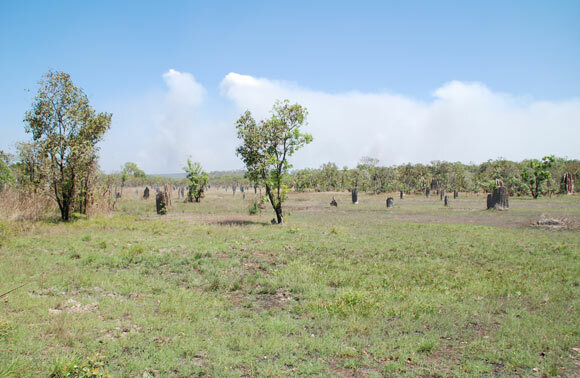 Elsewhere the Commonwealth's Carbon Farming Initiative motivates Aboriginal people to restore traditional fire management practices on their homelands. They combine modern environmental and fire science with traditional "mosaic" burning practices . Watch a video by the United Nations University about how the "two toolbox" approach saves thousands of tonnes of carbon each year. The discussion around the sacred canopy of trees already indicated the intricate links between fire, animals and plants. During a fire, bush turkeys hunt for bugs and insects at the fire line while hawks scour it for small animals. Animals know how to protect themselves from fire: ants and snakes go deep down into their nests and burrows, kangaroos find safe spots on rocky outcrops. Regular burning is also an effective weed control to introduced species like the African gamba grass which can increase fuel loads 10-fold . After a fire, if it was cool, new grass is growing only weeks after a burn. It holds the soil together and provides a source of food for wombats, wallabies and native birds, and ample of hunting opportunities prior to invasion. Brolgas (Australian cranes) eat insects that have been burnt. Wallaby, birds and other animals bathe in the cool ash to cleanse themselves, for example to get rid of lice. The black coals can also be used as medicine. Aboriginal people understand that fire is part of the healing process of the land. Children as young as four learn how to lose their fear and manage fire. Going back to their homelands, Aboriginal people want to heal the land from colonisation. Proper fire management is an essential part of this healing process. Here's a challenge: On your way to school, study or work, notice how people have interacted with the land. Where can you see respectful treatment of the land? Where are examples of ignorance, disrespect and abuse? What would these people need to change to be more caring? Use your mobile phone's camera to document examples. What can you do next? Did fire influence Australian trees? For thousands of years, Aboriginal people have used fire to hunt and to manage the landscape. Some scientists have argued that when people first arrived in Australia about 45,000 years ago they set a large number of these fires, which reshaped the country's ecosystems. This theory has become an accepted idea. A study from the University of Tasmania examined this theory by analysing the genetic fingerprints of a particular fire-sensitive tree found across the continent . It found that fluctuations in populations of these trees across the continent since the arrival of people were driven primarily by climate, not fire. Aboriginal use of fire seems not have caused a major restructuring of vegetation across the continent. "The effect of Aboriginal landscape burning is a lot more subtle. It's still important, but it's subtle and it's region-specific," the researchers concluded . NSW Rural Fire Service Crews use burning Banksia cones to start fires for back burning. Educational website CoolAustralia.org has prepared lessons and supporting material like worksheets for primary and secondary students. Lessons revolve around cool burning, fire management, benefits, climate change and the Fire Triangle model. A login is required to access the material. Check out primary student and secondary student material. Firesticks is an Aboriginal-led network that aims to re-invigorate the use of cultural burning. It offers cultural learning pathways to fire and land management and is open for Aboriginal and non- Aboriginal people to look after country, share their experiences and collectively explore ways to achieve their goals. Firesticks offers fire workshops and burning forums and demonstrations.